Nomination introduces SilverShine, a collection of charms crafted in Stainless Steel and Silver. 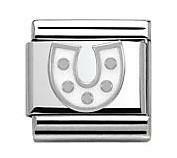 This lucky horseshoe is classic in White Enamel detailed with Sterling Silver for a stylish good luck charm to carry on your jewellery day to day. This charm is designed to fit the Classic size Nomination bracelet.